Refuse to give up on your mantle of blessing it’s yours! Your time has come! Your mantle is your inheritance, your perfect opportunity, your perfect role, your perfect task, your perfect responsibility, your perfect job that is passed down from your Heavenly Father according to His perfect will. Since your mantle is yours it belongs to you, no matter what circumstance the only person that can stop you from inheriting your mantle of blessing is yourself. God has already established His perfect will His perfect plan in your life, but the question is how far are you willing to trust God, to move in faith, to push past boundaries, to overcome challenges, to refuse to give up, and to give in! Elijah a man of God refused to bless Elisha! Can you believe it? A man of God holding onto someone’s blessing?! This is unheard of right? No it wasn’t, don’t you remember Jacob wrestling with the angel of The Lord for His mantle of blessing till day break? Jacob was left alone to fight for his mantle of blessing, and never gave in despite his injury he prevailed. Someone had to give up, someone had to give in and it wasn’t going to be Jacob, because he wanted it that much! Elisha travelled far and wide for his mantle of blessing! Someone had to give in, someone had to give up and it wasn’t going to be Elisha because he wanted it that much! How much do you want your blessing? Are you willing to go far and beyond, are you willing to fight for it? The problem is we give up so easily we have got to get into the habit of developing a tenacious spirit like that of Elisha, and a unrelenting spirit like that of Jacob. We have got to want what we deserve, what is our inheritance, that much! Remember God is not moved by the way we feel, God is moved only by our faith. Hence the woman with the issue of blood, was Jesus moved by how many years she had suffered through her condition? Was Jesus moved by her perhaps many complaints over the years? Jesus was simply moved by her touch of faith! For the woman of the issue of blood touched the hem of His garment, and His blood made her whole! The woman with the issue of blood refused to give up on her healing and her faith made her well. Elisha refused to give up on his mantle of blessing and he ended up with a double portion blessing. Jacob refused to give up on his mantle of blessing and he ended up with a double portion blessing. Ruth Cleaved to Naomi and ended up with a double portion Boaz! I know He rescued my soul, His blood has covered my sin. My shame His taken away, my pain is healed in His Name. I raised a banner for my Lord has conquered the grave! Double blessing is our portion! We have to move out in faith to get to the place that The Lord wants us to be. We have to fight the good fight the fight of faith the fight of prayer to get to the place that The Lord wants us to be. Your blessing is not going any where, even though people around you might assume so like they did to Elisha. Tell the critics, the assumers, the doubters, the liars, the discouragers, to keep silent! God shall never put you to Shame! Keep your eyes focused on God and not on people, put your faith and trust in God. Notice how Elisha said as long as The Lord lives and as long as Elijah’s soul lives! Elisha had so much faith that he knew he was going to inherit the mantle of blessing before The Lord would call him home! Elisha knew his source and his source wasn’t Elijah, his source was God and He trusted God for his inheritance! The Lord was just about calling Elijah home, but this did not stop Elisha’s determination. 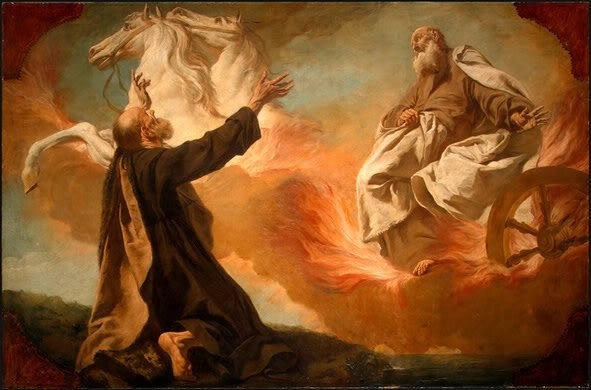 Elijah had a tenacious spirit meaning he had a firm hold on his mantle of blessing he clung to Elijah wherever he went adhering closely to him no matter how far he went. Elisha had his eyes fixed so much on the prize that he DID NOT ALLOW ANYTHING or ANYONE distract neither discourage him. Never allow ANYONE or ANYTHING to put you down! Keep your eyes fixed on the BIGNESS of your God! Not on the bigness of the problem. For this is what Elisha did, this is what Jacob did, this is what the woman with the issue of blood did and they prevailed! I REPEAT DO NOT ALLOW ANYTHING or ANYONE to PUT YOU DOWN! You do not belong down you belong up! You are not the tail you are the head! Don’t allow people’s words to stop you from doing what God has called you to do! Children of God can we please look out for each other? Children of God can we please be our brother and sister’s keeper? Children of God can we please encourage each other more? Children of God it doesn’t hurt to encourage one another. We are the body of Christ we must be bound together in cords of love that cannot be broken! This is love. These are beautiful words of encouragement from a brother to brother, a friend to a friend. I will be what God says that I will be. I’ll succeed in the things He’s planned for me! Every word spoken in my life! That will cement my destiny. Elisha went from Gilgal, to Bethel, to Jericho, to Jordan, he went from place to place, from pillar to post! Though the fruits of his labour was never in vain, no matter how hopeless his case seemed. Elisha never grew weary because he wanted it that much! His persistence caused him his victory! His tenacious spirit transformed doubters into believers! His faith spoke louder than words! His story changed and he began to perform great miracles! He pursued his blessing till the day The Lord took Elijah to heaven and he inherited his mantle his blessing. If we truly have a passion for something then we would want it that much to never give up on it. Like I said the problem is we give up to easily. The problem is we allow the enemy to discourage us with lies way to often. The problem is we look to people instead of looking to God. Remove the face of defeat! Overcome this problem of believing the lie and start believing the truth. The truth is that we are born to lead. The truth is that we are anointed. The truth is that we are more than conquerors! It doesn’t matter what you’re going through. God’s arms are always open wide! When we call in His Name!